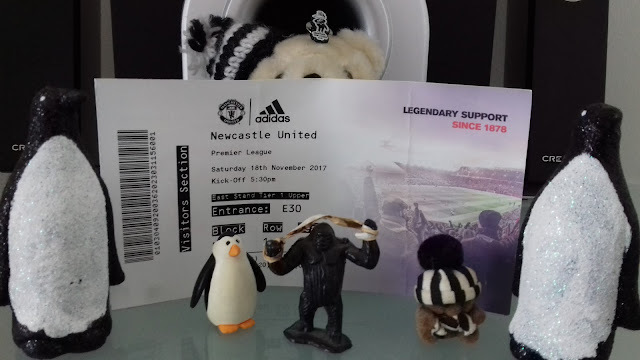 the geordie times online (newcastle united archive fanzine): MOAN U v THE TOON **** LATE SATURDAY AFTERNOOON! We face Moan U at 'The Theatre of Muppets' Saturday teatime and we have several injuries to contend with! Atsu, Merino and Lascelles are aal expected to be missin' az we aim to be the forst team to win there for ower a year! Their last 22 home games have resulted in them winnin 12 and drawin 10----and to be porfectleee honest a draw would be a brilliant scoreline for us--and the best we can hope for! Got mee hands on mee Moan U ticket for Saturday, last week! Before the 1958 Munich air crash, Man U were only best supported team ONCE in their history--the year before---compared to the NUFC record of best supported TEN TIMES up til that time! 'Legendary support'---yi havin a laff! Of course 'we' have not been immune to low attendances worsels, havin had 2 sub 8,000 crowds in the 1970s---but then again we ARNT claimin to have had legendary support since we were 'born' in 1892! Aa can remember taalkin to a Man U fan who drank in mee 'local' a few years ago, who woz much older than me, and typically he had been to 3 venues to watch hiz team---The public house---the club house---and hiz own house!--ie: he'd never been to Old Trafford! "Because of the Munich air crash!" he replied, addin that "Everbody in the country 'felt' for them after the tragedy---and many started supportin' them after this!" And then the penny dropped! : Before Munich they were just an ordinary team and after the tragedy they became massive! In the 80 years before the Munich air crash they were best supported just once az mentioned--and in the 60 seasons since, they have been best supported 49 times! Anyway!---We are travellin by choo choo train ower the pennines in the aaful 'Trans Pennine 'Express'? (which does 5mph on certain parts of the jorney!) and it will be packed to the rafters with 'standin room anly' by the time we reach Leeedz! A full Geordie Times match report will follow on Sunday---sometime!